SAN FRANCISCO – Dec. 21, 2012 – PlayFirst® Inc. the global leader in mobile games for family and friends, today unveiled seasonal updates for Diner Dash® and Mall Stars™ on iPhone, iPod touch, iPad and iPad mini that offer a holiday-themed haul of exciting new content for both games. Flo brings the holiday cheer to Diner Dash in this festive update, donning a snazzy Santa hat and decking the halls of her diner with new decorations. Players can enjoy a snow-speckled DinerTown exclusively in this expansion, complete with antler-wearing customers and a snowman chef! 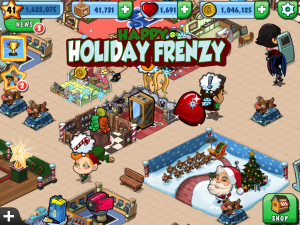 As an additional stocking-stuffing delight just for the holiday season, keep the good times rolling with a free Winter Wonderland location and brand-new mega celebrations at the end of every level. The Mall Stars Winter Wonderland update offers players a bounty of new attractions, decorations, and outfits for the Stars, along with a new mini-game starring Santa’s Little Helper, Saint Nick’s favorite elf. As the winter shopping frenzy looms, it’s the perfect time to escape the real-world madness for the fast-paced, fun-filled retail rush of Mall Stars. Players can access the new content from the Diner Dash level map screen or the Mall Stars in-game marketplace starting today. 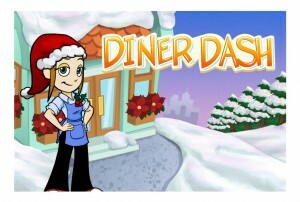 The Diner Dash and Mall Stars Winter Wonderland updates are only available for a limited time, grab your gifts soon! To access the new content, along with the original game, download Diner Dash and Mall Stars for free on iPhone, iPod touch, iPad and iPad mini via the iTunes App Store. Diner Dash follows former stockbroker Flo as she quits her day job, rolls up her sleeves and grows a greasy roadside diner into a five-star restaurant. As the most influential time-management game in history, Diner Dash tasks players with taking orders, serving up food and keeping customers happy as Flo pursues her dreams. Diner Dash has captivated players across all age groups and expanded into a massive franchise with over 650 million total downloads. In Mall Stars, players build and customize their malls to cater to larger-than-life VIP customers, the ‘Stars’. Each Star has his or her own favorite products and attractions. By filling their malls with must-have products and attractions, players excite the Stars into frantically fun Shopping Frenzies and earn special bonuses. Stars make their requests based on players’ progress in the game, using PlayFirst’s sophisticated StarRequest recommendation system to ensure a fresh, exciting and new level of fast-paced fun. At PlayFirst, we believe you can have fun anywhere, any time and at any age. That’s why we’re committed to creating mobile games for everyone to enjoy, including the fan-favorite DASH® and STARS™ series of games like Diner Dash®, SpongeBob Diner Dash® and Mall Stars™. Whether you’re in line at the store, on your lunch break or lounging at home, you only need a minute to dive into a PlayFirst game—but you’ll find a lifetime of entertainment. PlayFirst games are played by tens of millions of fans worldwide, and we’re just getting started. To find out more about our talented team and our awesome games, please visit www.playfirst.com. PlayFirst, Diner Dash, Wedding Dash, Cooking Dash, Hotel Dash and Mall Stars are registered trademarks of PlayFirst, Inc. All other trademarks are property of their respective owners.